When I began looking for a new bandsaw I started by reading reviews that other bandsaw owners had posted on various websites and forums. These proved very helpful so I wanted to share my experience which will hopefully be helpful to others. I have now owned the saw just over a year so I have some reasonable experience with it. First I want to qualify the star rating I have given the Lagona LT18 3000. As it sits in my shop today and for my intended use I would give it a 4. It took me some considerable effort to get to this point so “out of the box” I would give it a 2. You can form your own opinion after reading this review. Photos: I’m not including the specifications or stock photos of the saw. You can get these from Lagona’s website. My photos show the saw as I have customized it. Background: I already owned a Delta 14” bandsaw purchased about 1987. Over the years it always seemed to have the wrong blade on it for what I wanted to cut, so I decided to explore the purchase of a second saw. I also wanted a larger saw so I started looking at 16” – 19” saws. I researched every brand that would appear in an internet search and went to every showroom I could to evaluate saws on the floor. I also made a trip to Grizzly in Muncy with a particularly interested in their 17” saw. Grizzly had many models on display and the assembly/setup on most were poor. One saw might look very good while the adjacent one had a warped table and the one on the opposite side had parts missing. Only one saw was actually set up so I could see it run. Although they have a massive warehouse at that location they had next to nothing in stock to purchase which is probably why the staff acted like I wasn’t even in the store. That experience dropped Grizzly way down on my list for consideration. Selection: I had previously looked at Lagona on-line and Lagona furnished me the name of a bandsaw owner in my area as a reference (although that person had a different saw than the one I ended up purchasing). All the brands of saws I looked at had various pluses and minuses that varied with price. I basically decided on the Lagona LT16 but after talking with the Lagona staff I ordered the LT18 3000 series at about the same price as the LT16. I’ll have to say I don’t like spending this much on blind faith, sight unseen. Delivery: The saw was ordered direct from Lagona ($2,195 free shipping) on 10/7/2010 but was apparently out of stock, none in the USA. Shipped 11/3/10, delivered to me 11/10/10. The saw arrived fastened to a pallet covered with a light wood frame and cardboard box. Mine arrived undamaged except that the blade tensioning screw had come unscrewed and had fallen out. The table and motor are in separate packages within the crate. Although the motor is in its own box, it is fully wired ready to be mounted and is fitted with a NEMA 6-20 plug ready to plug into the wall outlet. Assembly: You need a couple of people to get it off the pallet. I had to take out the top wheel to fit the spring and washers back into place to reassemble the tension knob. The assembly instructions are good. After cleaning off the rust preventative I mounted the motor and table. The table mounts with two bolts through the trunnions, one has a fixed, self-locking nut, the other has a tightening knob requiring a longer bolt. One of my bolts was too short. I e-mailed Lagona and their technical support promptly called me and said they would send a new bolt out immediately. I waited about two weeks and contacted them again. Someone forgot to send the bolt. When I did receive the new one it was the same length as my too short bolt. I called them again and they sent a slightly longer one, still not really adequate. I ended up making my own. I cut the shaped head off of one of the factory bolts, drilled the bolt out of the shaped bolt head and retapped the hole. I then screwed in a piece of appropriable sized threaded rod and welded it in place. With this now complete, I applied a coat of Slip Plate to the trunnions before mounting the table. Although I had read that Lagona had terrible customer support, they always responded to my requests. They called me back repeatedly if they got my voice mail. Table: The table mounts to the saw on heavy cast iron trunnions. The trunnions are wide apart giving the table good support, see photo. I passed up several other makes of bandsaws because the trunnions were too close together allowing some flex in the table. I check to see if the table was true flat. Passed. The table finish is smooth but by no means is it a slick mirror like finish as other machines I looked at. I polished it down with some 400 and 600 wet/dry paper and applied a coat of Boeshield. The tilt arrangement works well. Motor Assembly: The saw came with a Leeson TEFC motor. The saw is advertised at 4HP. The motor nameplate indicates 5.5HP. The rating is 230 Volt 15 FLA. Doing the math, that probably means the motor is somewhere between 3 and 4 Hp. The motor mounts quickly and it is easy to adjust belt tension. Setup/Blade Installation: Next I checked to see if the top and bottom wheels were coplanar. After adjusting the top wheel tilt, the wheels were perfect (and to date, I have never readjusted the top wheel tilt with any blade I have used on the saw). Nickle Test: I installed the 5/8” Shear Force blade that Lagona furnished with the saw. As soon as I started it I noticed an immediate vibration. Fiddled with it a while and decided I needed to try another blade. I ordered a new Wood Slicer blade from Highland Woodworking and when it arrived I installed it and the vibration was worse. The Wood Slicer blade was not welded straight. I returned it for them to inspect and they sent me a new one. So after waiting for the table bolts (twice), and waiting for a new blade (twice) I’ve now owned the saw two months and I haven’t cut anything. With the new Wood Slicer in place I still had the same vibration as with the Shear Force. Next, I went through all the normal “stuff”, spinning the wheels to see if they have a heavy spot, measured wheels with dial indicator to see if they had high spots, etc. After fiddling with it on and off a couple more weeks I again contacted Lagona. They had me reinstall the dial indicator against the face of the blade with the blade on the saw so it would apply tension to the rubber wheel to see if there were hard spots. This didn’t tell us anything. Lagona next suggested I sand the wheels. Sanding the lower wheel isn’t too bad as you can do it with the blade removed. I mounted some sandpaper on a wood stick that I could brace against the saw framework. After some considerable reshaping of the rubber the saw ran much smoother. I then went after the top wheel installing the blade with the teeth turned in. There isn’t a good support for the “stick” at the top but I did make some headway surfacing the top wheel without getting killed in the process. Reinstalled the blade and tried the Nickle Test. Passed. Now maybe it’s just me, but I don’t think a customer should have to sand the wheels on a brand new saw. It should have been tested before it was shipped. 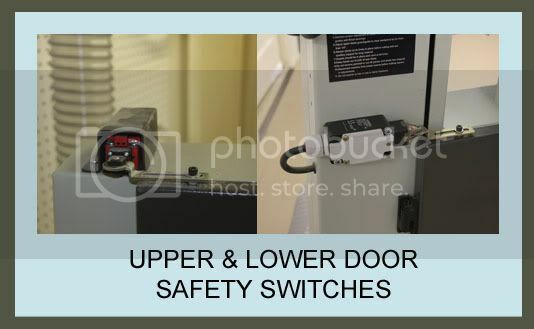 Safety Switches: I added limit switches to the top and bottom doors so the saw will not start with the doors open. Tension Release: I like the quick release for the blade tension on this saw. I added a limit switch so the saw can’t start until you tension the blade. I have a tension release on my Delta saw and half the time I start the saw and forget that the tension leaver is released. The limit switch installation on the Lagona was fairly simple. Motor Controls & Disconnect: Lagona mounted the motor starter on a metal plate behind the main column. I moved it to the face of the column to allow the saw to sit closer to the wall. I then used the metal plate from the starter to mount a disconnect switch to the opposite side of the column. I like a disconnect switch rather than using the plug as a disconnect. Mobility: I fabricated my own “mobility kit”. The wheels came from Hamilton Castor (W-315P-5/8) and have roller bearings that fit on a 5/8” steel rod. I fabricated the rest. Cost me about $80. See photo above. Fence: The fence furnished with the saw is adequate. A low-high fence would be much better (and would cost more). You’ll have to add a board for resawing, but I don’t do much of that. Blade Guides: This saw has Lagona Guides. Some people love these but the verdict is still out with me. The lower guides are mounted much closer to the underside of the table than other bandsaws I considered. I think this is a plus. The Lagona guides on my saw have a plastic head on the lock screws, one of which has slipped on the screw head so you couldn’t loosen the guide. I used epoxy to secure it, but it may need to be replaceed. Dust Collection: This machine has two 4” ports. I have both connected to a single 4” line using a tee. My system is hard piped and powered by an Oneida 2HP cyclone. Dust collection on the bandsaw is very good. Foot Brake: The foot brake is equipped with a switch to turn off the saw. 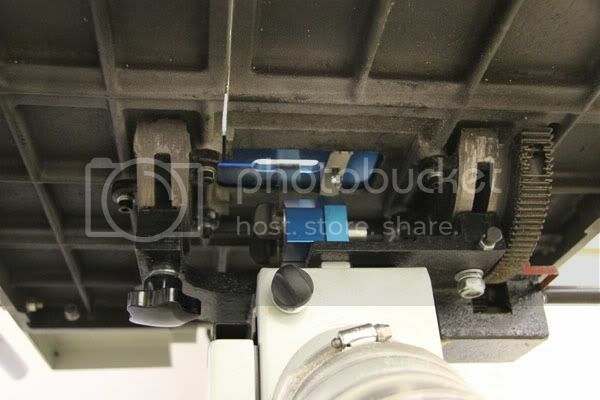 I like this feature (to trip off the motor) but it takes a lot of pressure on the foot pedal to stop the blade quickly. Conclusion: Having gone through all these fixes and modifications, I now have a saw I like and it works very well in my shop. I normally run a 1/4” blade on my Delta saw and a 5/8” or 3/4” blade on the Lagona. I’ve used the saw for a variety of different jobs in the past year, and since I’ve always been somewhat afraid of the table saw, I use it a lot. I generally use wide blades but also have some smaller blades for cutting out bowl blanks, etc. Additional concern: I want to add a concern I have about blade tension on this saw and the response I received from Lagona regarding this. There are a lot of opinions regarding correct tension and the way to set it, some use the half twist method, some push the blade and check for deflection, some go by sound and with some blades the flutter method may be recommended. There are many recommendations on the web about this including a very good article by Lonnie Bird at Fine WoodWorking.com. I’m not going to debate the “correct” tension or method here. But I want to share my findings and concerns regarding this particular saw. You can form your own opinion of this saw’s capacity. As I stated, I normally use 5/8” or 3/4” blade widths and do not do a lot of resawing, so for my use, this is more a perceived problem than one that has caused me any real difficulty to date. I first noticed that I had to wind the tension nearly all the way to get what I considered correct tension on the 5/8” blade using one or more of the methods mentioned above. Since the factory tension indicator on this saw is not calibrated, I decided to mark it for various blade sizes by use of a blade tension meter. There is an interesting video on YouTube about calibrating a bandsaw tension scale, Using the Bandsaw Blade Tension Gauge available online. I installed the blade tension meter on several blades. 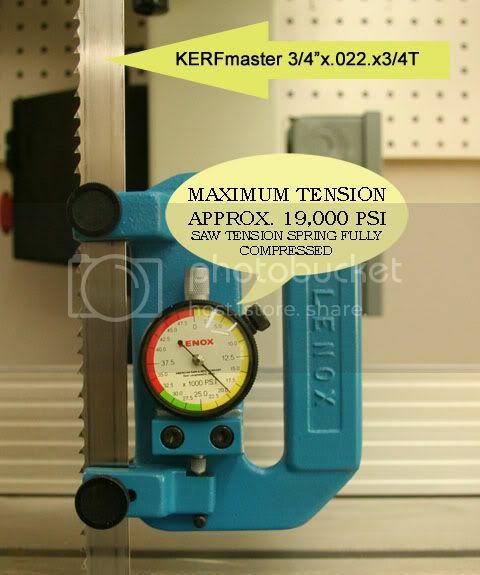 The photo below shows it on a KERFMaster 3/4” x .022×3/4T blade from Spectrum Supply. With this blade the tension is maxed out (tension spring fully compressed) at approximately 19,000 PSI. I expected to get this tension closer to the middle of the tension scale. The next photo shows the tension meter installed on a Lenox Woodmaster CT 1”x.035×1.3T. 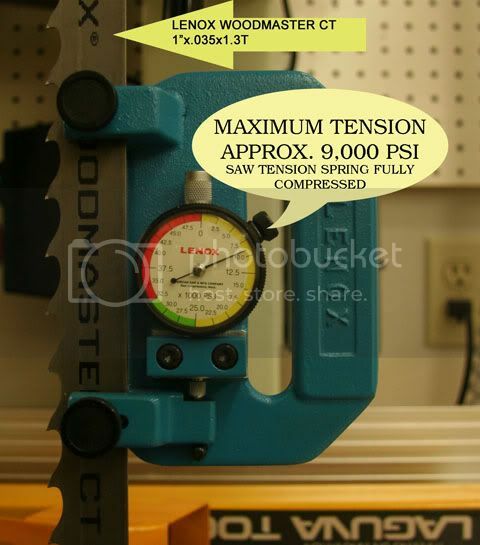 Again, the tension is set to Max with the spring fully compressed which achieves a tension of about 9,000 PSI. On my saw, this is not enough tension to stop this blade from fluttering. Lagona lists the max blade size for this saw at 1-1/4” so I sent them a detailed e-mail expressing my concern about blade tension (or lack thereof) on this saw. Brian at Lagona responded back and left me a voice mail message: “We don’t go with any tensioners to figure out the PSI against the blade, cause you don’t want to over torque those things anyway and go to the max tension cause usually what happens is (laugh) they break”. The only other suggestion Lagona offered was the that I shorten the blade length by ½” and try again. That made absolutely no difference in blade tension when it was installed on the saw. I also want to share with you my comparison of the tension spring from my saw with a spring from another manufacturer’s 18” saw. 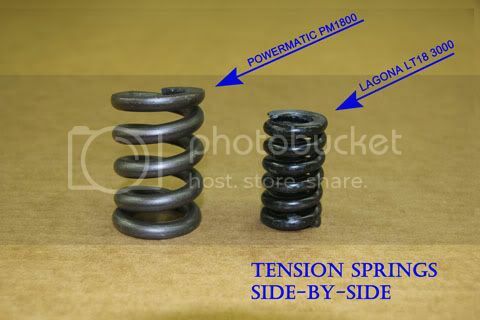 The photo below shows the spring from the Lagona LT18 3000 side-by-side with the tension spring from a Powermatic PM1800 (both 18” saws). The next photo shows the two springs, end-to-end under compression. 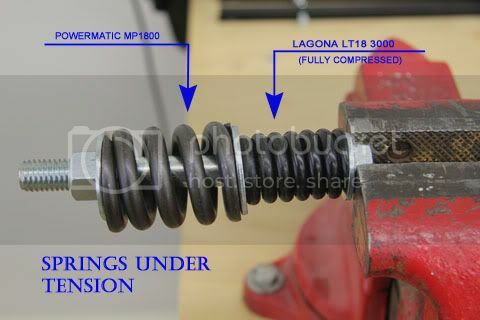 The Lagona spring is fully compressed as it would be when the saw scale is at max. As stated, I normally use a 5/8” or thin 3/4” blade on this saw and have not experienced significant problems with the saw cutting straight in my application. But this may be a concern for those of you interested in using larger blades or doing a lot of thick resawing. I’m to the same point with my Delta 14”, and am actively looking for something much better (not necessarily larger, but I know it’ll be a 16” or 18”. I’m very interested in how this plays-out for you. Laguna has a great reputation, and I’m surprised to see what you’ve shown here. The Laguna 16”, the Minimax 16(MM), and the Felder are on my short list. I have had the Laguna 16HD for a few years now and am very happy with it. Experienced none of the issues with vibration you write about. I enjoyed your narrative, and the pictures are great. But admit it: you must enjoy tweaking your tools to your liking as much as you enjoy the actual woodworking! And those limit switches you are using so liberally can’t be cheap. Thanks for the thorough review. 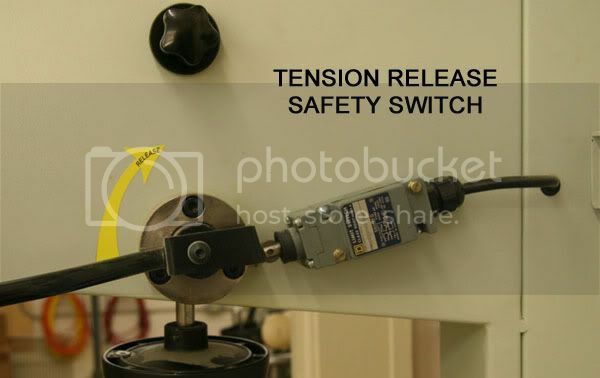 To prevent starting my BS without setting the tension I took a magnet (the size if a business card, often given out for free with advertising) and laminated the word TENSION on it. I leave it right infront of the blade guard. Very simple and effective. Not my idea; saw this somewhere. Works for me and much cheaper than limit switches. This really IS a very thorough and comprehensive view, but … at the end of reading every single word of it … I don’t think I’M as happy with YOUR saw as you are. Which really isn’t what matters, I know, but ….. If you cannot tension the band to the PSI that YOU think is both reasonable and appropriate … for me … that’s not cool. Their responses to your inquiries seem to match the sort of conventional wisdom that says … Laguna: good products, lousy customer service. Have you considered a phone call to Louis Iturra, to discuss your experience, and see if he has a spring that might make your saw tension higher without fully compressing the spring ?? I like Julian’s idea about the magnet card and have several stuck to a file cabinet. I’ll try this approach on my Delta saw. As for the limit switches, I purchase mine on e-bay. There is always at least 100 on there and the name brand, (AB, SqD, etc.) switches I’ve used, which would cost $150+ dollars at the electric supply, have all been purchased in the $25 – $35 range. I also agree with Neil, my relationship with this saw is love and hate. I’m not as happy with my saw as I should be having spent that much money and my point in posting the review is to share my experience for what it is. I have looked at other springs and have some ideas that might improve this. But there are several design problems with the tension mechanism that limit the options. There is an article in Swedish Woodworking replacing the spring on a Hammer N4400 in order to increase the blade tension on that saw. This individual purchased a commercially available die spring and remedied the problem with his saw. I looked into doing the same with my Lagona saw. But . . . The spring on the Lagona LT 18 3000 sits inside a housing that moves up and down with the tension release. The factory spring is slightly over 1” diameter and has an uncompressed length of 2”. It is also enclosed in a “box” within the saw farme which limits the length of the spring. The spring mentioned in the S Woodworking article and the Powermatic spring shown in my photos are 1-1/2” diameter and won’t fit in the housing. I have also looked at the tension arrangement on some other 18” saws and they all seem to use a larger (longer and bigger diameter) spring than my saw. A longer spring of larger diameter would give much more range in the tension adjustment. I thing this tension mechanism is appropriate for a 14” saw and misapplied to the 18” saw. I so have a new 1-1/4” diameter spring, the heaviest in this size available from ASRaymond which I intend to try in my saw when I have time. And, I may fabricate a larger housing to accomodate the 1-1/4” spring if I cannot make fit in the factory housing. But that introduces yet another question, will the framework of the saw withstand more tension? I’ll need to attach a dial indicator and measure the deflection of the upper housing (wheel) to know for sure. I will add that this is only an option because I already own the saw. The remedy for everyone else is to purchase a heavy duty saw in the first place. As I stated, my intention was to purchase the Lagona HD 16 until the sales people suggested that I could get an 18” saw for about the same price. For my time, effort and money, I could have had an Italian made 18” saw. Hey Hate2sand, that was the very best, most informative, review I’ve seen anywhere. You need to join the writers guild and write more tool reviews. I enjoyed reading your review and learned a lot. I especially appreciate the pictures. I am humbled to say that I have a 14” Craftsman. It fits my budget and is sufficient for my home shop. I will look into upgrading the tension spring. I’m going to post you on my watchlist and look forward to more reviews. Attn: Lumberjocks management, pay attention! You got an ace here, don’t let him get away. Larry, very nice, thorough review. What’s your opinion of the saw 3 years after you last commented? You’ve more patience than I. I would have returned the saw to Laguna and bought a different manufacturer.